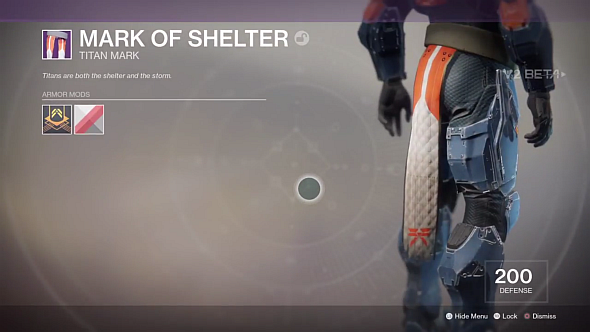 Your armour in Destiny is almost as important as your weaponry. 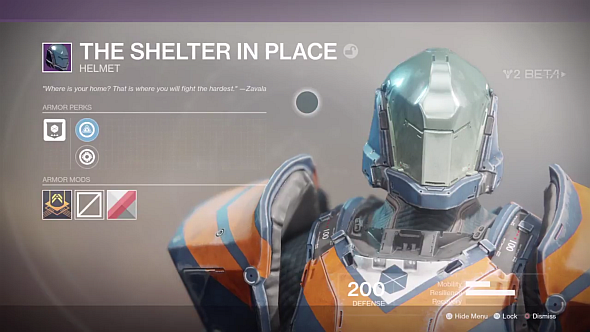 In Destiny 2, it’ll determine your resilience, mobility, and recovery, as well as – we think – your ability cooldowns, which have been the subject of much debate after the recent console beta. More importantly, it affects how you look, so to succeed at the fashion game that we all play whether we like it or not, you need to know which armour sets to grind for. Read on to learn all of this. But what about making things explode? 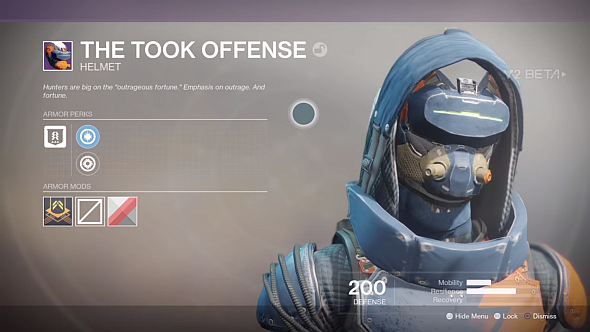 You’ll want to know about Destiny 2’s legendary weapons for that. 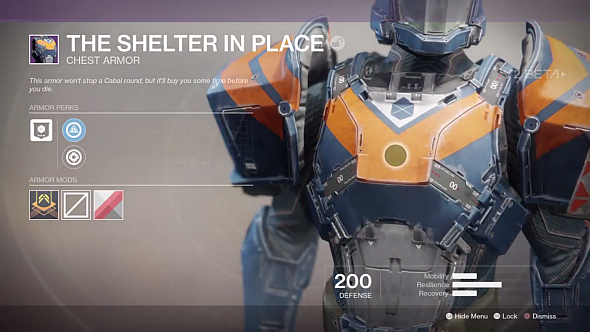 Armour in Destiny 2 governs your character’s mobility (jump height and movement speed); resilience (shield hit points); and recovery (shield recovery delay). Itmayalso enable you to hasten your ability cooldowns – but we’ll get to that. 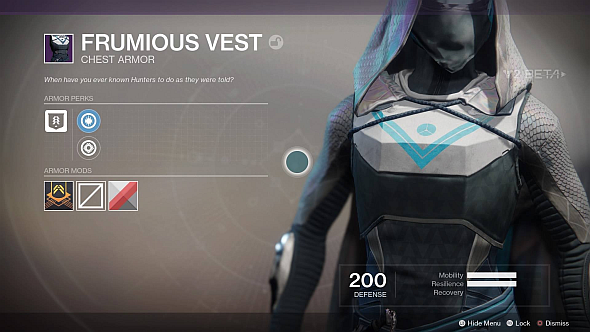 Based on the evidence in the beta, legendary armour has an intrinsic perk, and then a choice of two unlockable perks. The intrinsic perk boosts one stat at the cost of another, and though the boosted stat can vary, we haven’t seen an example of a class’s characteristic stat getting reduced. 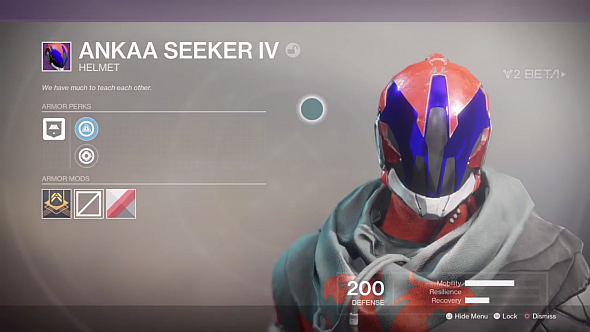 So these intrinsic perks seem designed to ensure that, no matter how you configure the other two, Titans will always be the tough class, Hunters the mobile one, and Warlocks will have the fastest recovery. Note the armour mods panel in the image above. 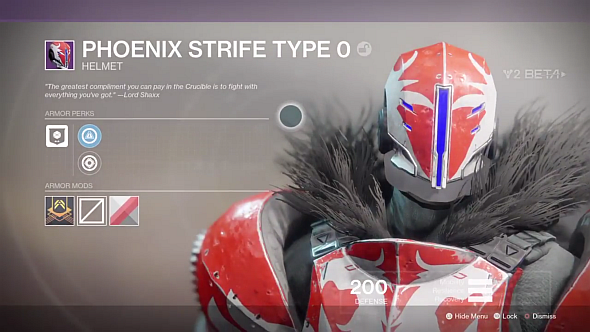 As with legendary weapons, there’s an infusion button and a shader, but also a mysterious armour mod slot. There’s some evidence that armour mods might hasten ability cooldowns: after all the kerfuffle from the beta about them being too slow, Redditor FinalForumposted this imageof armour with perks that increased grenade, Super, and class ability recharge speeds. Those images were taken before the beta, so everything could easily have changed, but it would make a lot of sense for equippable armour mods to hasten ability cooldowns. 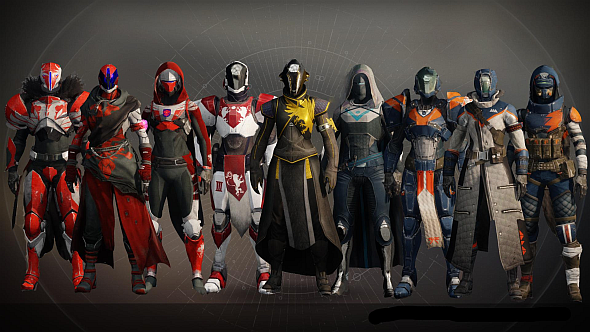 Like individual shaders and fixed perks, it should make it easier to put together a ‘perfect’ armour set that looks and behaves exactly as you want. 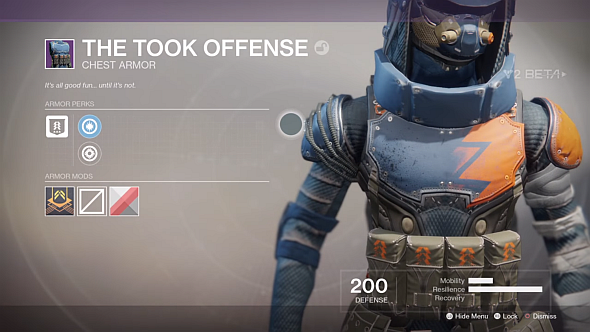 Most factions and activities had an associated armour set in the original Destiny, and based on evidence from trailers and the beta, it looks like the sequel will follow the same pattern. 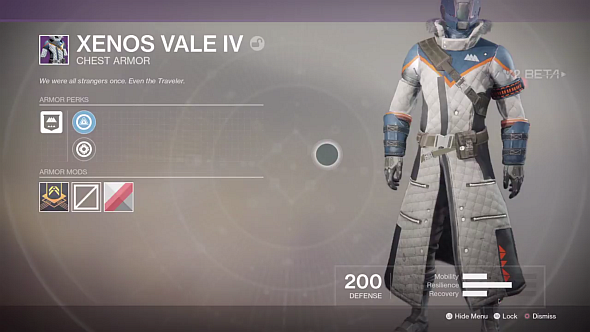 Confirmed so far are Vanguard and Crucible sets, earned respectively by completing the game’s main PvE (Strikes) and PvP (Crucible games) activities. 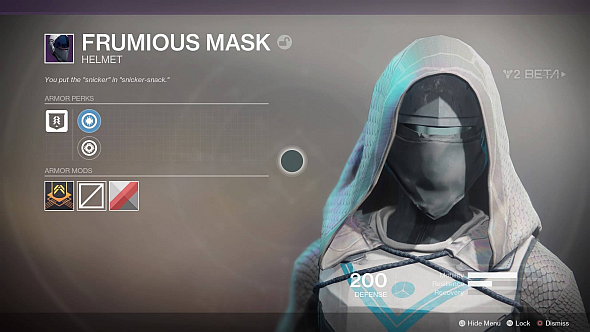 Expect also armour sets for Dead Orbit and other factions, for the Raid, Iron Banner, and whatever replaces Trials of Osiris. 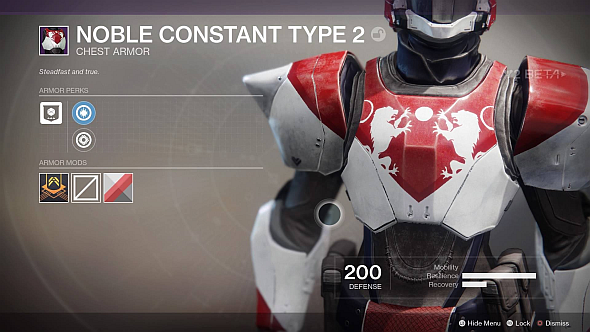 And on that note, let’s take a look at all the armour sets in the Destiny 2 console beta. The finer points about how armour will behave in the finished game may change, but the look of these sets almost certainly won’t, so start picking out your favourites. 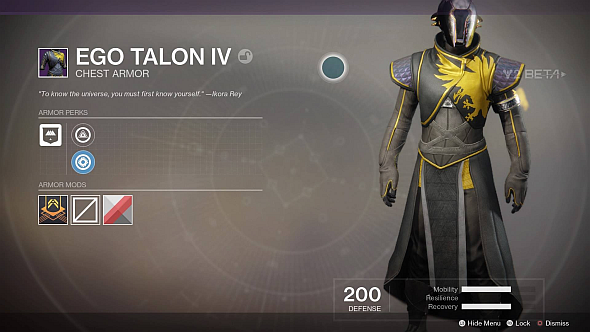 This is the ‘default’ Warlock armour – the slick black-and-gold set used in Destiny 2’s promotional artwork. 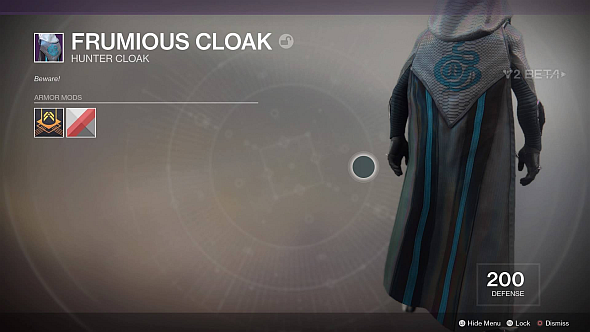 Warlocks spawned with this set in the beta, but it’s vanishingly unlikely you’ll start the actual game with a full set of legendary gear, unless losing it immediately is part of losing your Light. It’s not clear if it has any faction affiliation and where it can be obtained (or if it even can) in the final game. 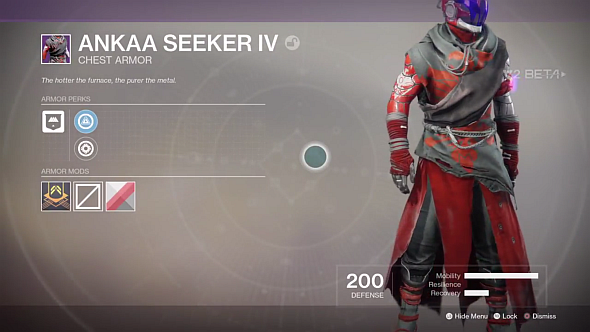 In the beta, the Ankaa Seeker set drops from Crucible games. 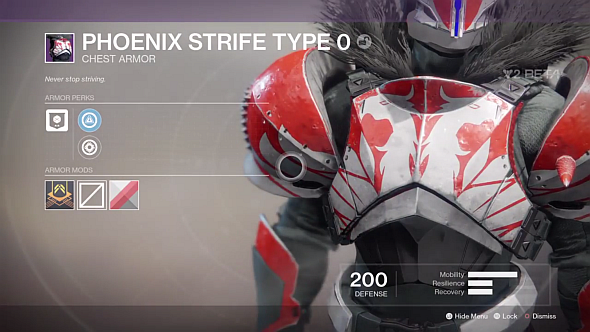 In the finished game, it might also be available for purchase at the Crucible vendors. 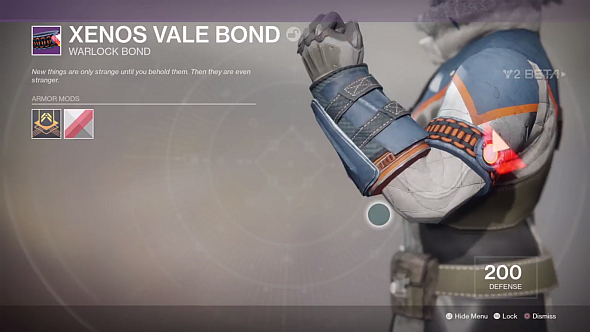 We know PvP boss Lord Shaxx is back in the sequel as he appears in its first mission, and we’re guessing he survives to continue his duties, based on the quotations over the Crucible modes in the beta and the fact he’s such a badass. Led by Commander Zavala, Cayde-6, and Ikora Rey, the Vanguard are humanity’s best Guardians. They’re the front line, dispatched to take on the toughest missions, also known as Strikes. 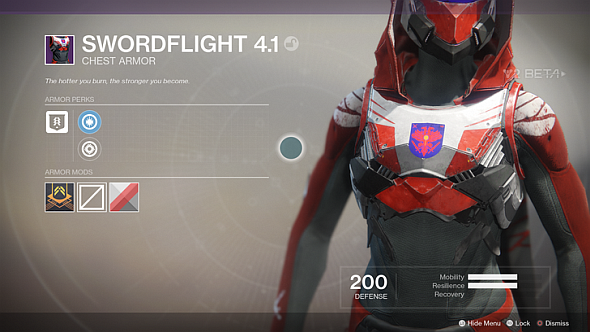 Vanguard armour dropped from the Inverted Spire strike in the Destiny 2 beta, and may also be purchaseable from your class mentor in the finished game. For Warlocks, that’d be Ikora. 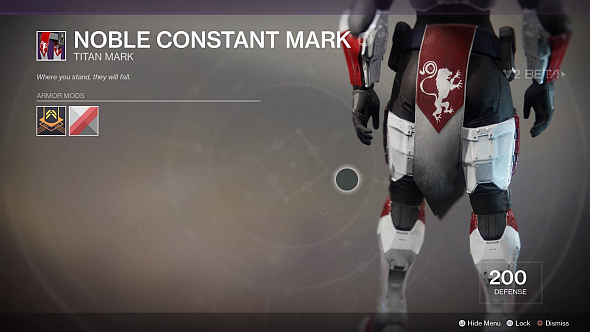 This is the ‘default’ Titan set as seen in trailers and promotional art – the very fetching red-and-white armour with the lion decals and big pauldrons. 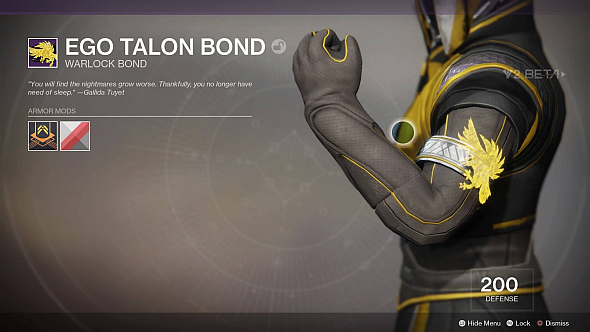 As with the Warlock’s Ego Talon set, it’s unclear where we’ll obtain this in the final game. 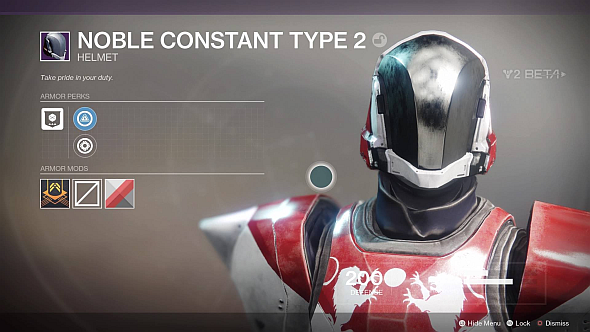 This is the Titan’s Crucible set, and alongside Noble Constant, one of my personal favourites from the beta. Check out that fur collar, and those fierce spikes on the pauldrons! 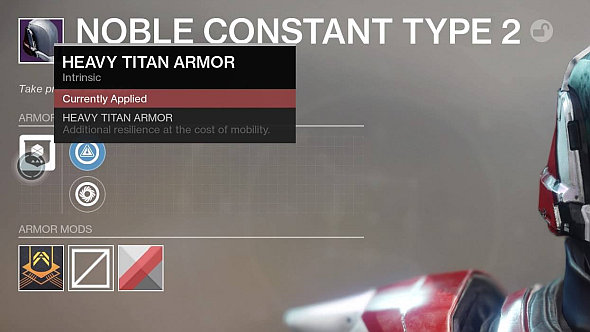 Key takeaway: roll a Titan for fashion Destiny. 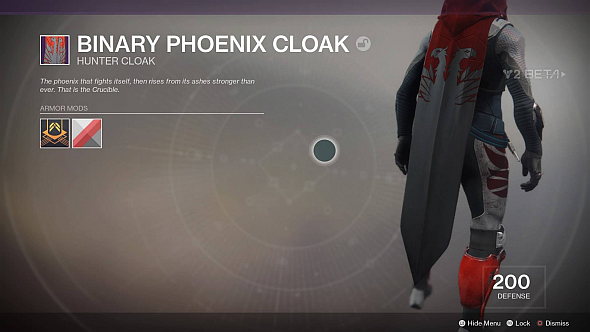 As with Ankaa Seeker, expect this to drop from Crucible games. The orange-and-black colour scheme and the huge ‘V’ decals make this about the most obvious Vanguard set we’ve seen. It has lots of flavour text about dying. 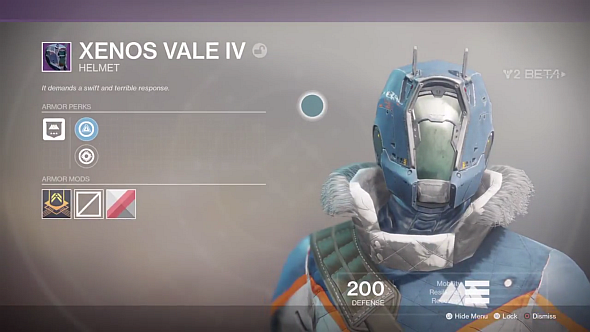 Expect it to drop from strikes, and if this were the original Destiny, you’d also be able to buy it from the Titan Vanguard Commander Zavala. Who knows if that’ll remain the case in the sequel. Maybe it’s a reward for rescuing him from Titan? This is the Hunter’s promotional set, and very nice it is too; I particularly like the scales. 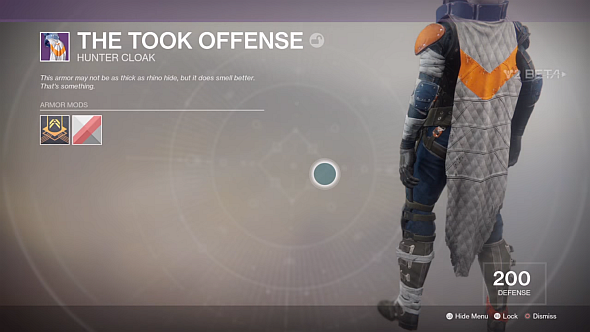 In the reveal event it was called Bandersnatcher, which we personally prefer, but it’s nice to see Bungie are sticking with the Lewis Carroll theme. 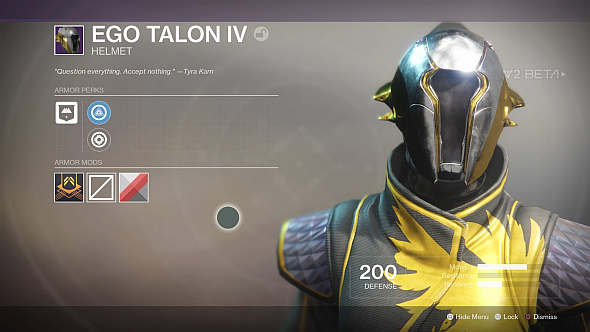 As with Noble Constant and Ego Talon, it’s not yet clear where you can get it. The Hunter’s Crucible set is okay, I guess. I like all the sharp angles (note the cloak, with its dagger-like point and sharp crease). 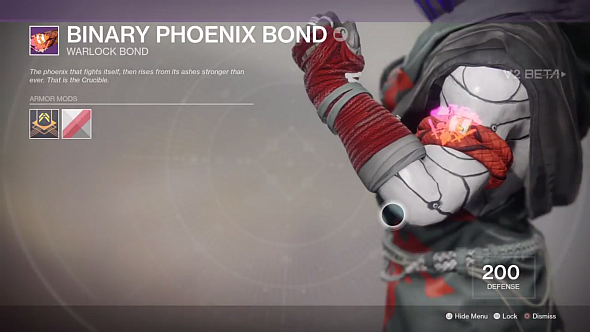 The class armour shares the same quotation and naming as the Binary Phoenix bond and mark, in a curious stylistic departure from the rest of the set. 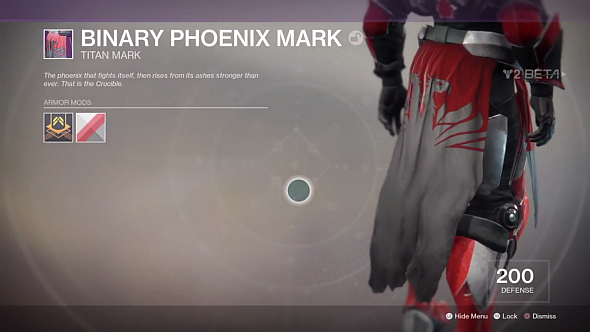 The Hunter’s Vanguard set looks appropriately weatherbeaten, even ragged – look at that cloak. 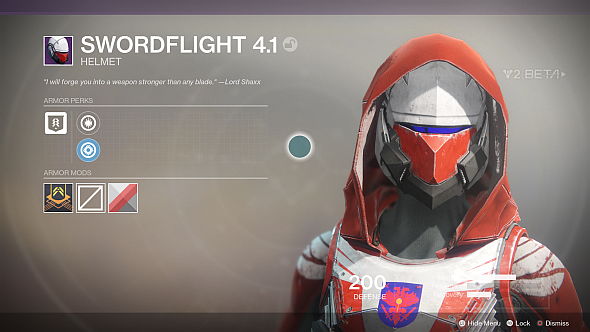 In the lore, Hunters commonly pride themselves on being the flashiest and most stylish of the classes, so this is an unfortunate slip in form. There will be dozens more of these previewed before launch, and doubtless, more added as the game progresses. You’ll find them all right here.